Today’s a very special day for English literature. On this day, 7th February, in 1812 , Charles Dickens was born in Portsmouth, United Kingdom. On this special day, I’d like to suggest you read one of his novels, so I’m including my ‘special tribute review’ of Oliver Twist, which you can read for free as a kindle ebook on amazon, thanks to a community of volunteers who converted this novel from its physical edition to the digital format. If you only read one of Charles Dickens’ books, or if you don’t know where to start reading his books, I recommend you read Oliver Twist, the unforgettable story of a poor orphan boy, who spent his early years in a work house, before being recruited by a gang of pickpockets. It’s not an easy book to read, and is not meant for children or the faint of heart, because it portrays some harsh events, many of which Dickens had experienced himself, or had personally investigated, and that is one of the main attractions of this book; It’s real. You may read about child labour and the plight of the many orphaned children in Victorian England, but no history book will describe a workhouse, the inside of a prison, the starving dogs and hungry rats, the life of a pickpocket, a thief, a pimp, or a gang leader, a public hanging, or the cruelty of London slums, the way Dickens does. Read it if you want to know what really happened, what the streets, people and life was like for Victorian Londoners. I never tire of rereading it myself. Dramatic, yes, exaggerated, I doubt it, realistic, shockingly. The plot is a page turner, and the characters come to life in every scene. We see their gestures, smell their ragged clothes and listen to their lies and truths. I love Dickens’ use of the English language. It may be wordy by contemporary standards, but it’s smoothly done. A real pleasure to read for anyone who loves the English language and wants to take a short trip to Victorian London. A book to read once and reread all your life. Although I usually read my paperback, this free kindle version makes it even easier to read. A big thank you to the volunteers who made this edition possible. As a writer, I often read a random chapter or passage before I sit down to write. Dickens humbles me, but he also gives me great encouragement by showing me how the English language can convey so much using the right combination of words. ‘Capital!’ As Dickens would say. I’ve written a piece of Flash Fiction based on Oliver Twist, and included some information about child labour and orphans in Victorian England in this post. I’d like to include one of Dickens’ quotes, which is one of my favourite. Dickens wrote his books with the aim of making the world a better place, which he did, through numerous campaigns and by building awareness among the reading public, but his greatest legacy was the belief in the power of words to improve our world. As well as influencing me as a writer, Charles Dickens also makes a personal appearance in Twelfth Night at Eyre Hall, my sequel to Jane Eyre, and is a vital part of Jane’s recovery in Midsummer at Eyre Hall, although he is no longer physically present. 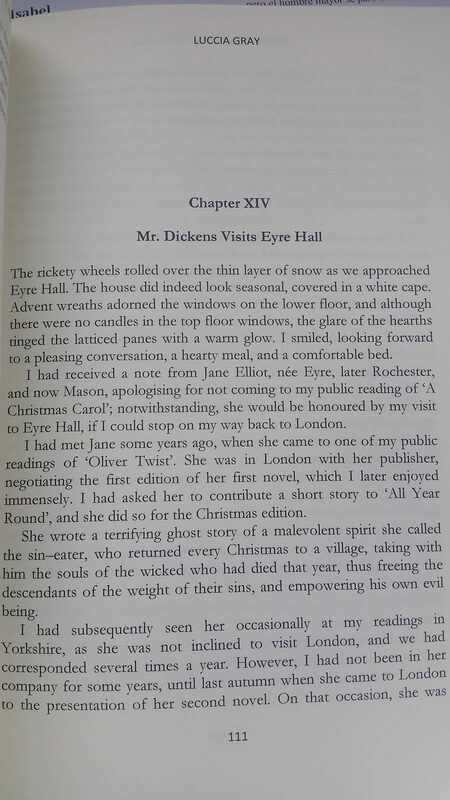 Here is the page with the moment Charles Dickens arrives at Eyre Hall to spend a few days with Jane Eyre, now Mrs. Mason. They spoke about their private lives, the craft of fiction, and also about current affairs such as child labour and abuse, public hangings, and the dangers of the slums of London. It’s one of my favourite chapters. Which is your favourite novel by Charles Dickens? Why not write a review and share on a blog post to celebrate his birthday! I love a Tale of Two Cities. I read it as a teenager and it still remains with me. I love the richness of the prose, and the tale itself is so haunting. Dickens was a genius. I’ve made it a habit to pick up a Dickens novel once a year. I’ve never been disappointed. Last one was Little Dorrit. Happy Birthday, Charles! You still have fans and readers! That’s my favourite, too! 💖 It’s also quoted in my fourth novel, my current WIP. There’s something magical in Dicken’s writing. I love the way he portrays drama and trajedy, I know it sounds like a cliché, but he’s second only to Shakespeare in that aspect. They both nail human nature at its bleakest point. You’re right. And I do love that. Last night at the BAFTAs, Stephen Fry said when the whole world looks bleak Hollywood gives the Oscar to a movie that lifts our hearts. The year Martin Luther King was assasinated Oliver! won the Oscar for best picture. Thanks Charles. Wonderful film 💗 I’m sure Dickens would have been shocked at the assassination.